Axiom Verge is praised for being able to out-Metroidvania even the likes of Super Metroid and Castlevania. This retro-styled game is able to revitalize the 2d action/exploration genre that was in serious need of an entry to remind old-school players why the started gaming in the first place and introduce newcomers to a world defined by tight gameplay and interactive mechanics. 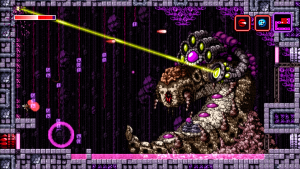 At the core of those mechanics is Axiom Verge’s exploration, backtracking and usage of intended glitches which destroy enemies in the alien-like world and double as necessary tools for exploration. 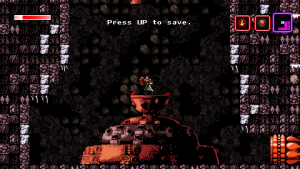 Tom Happ spent the last five years as the sole developer on Axiom Verge; programming each sound effect, enemy, weapon, color choice, story element and environment within the stylized shooter and was willing to share insight into his process. “I ended up not going with that exact formula because I realized there was a lot more versatility with a ranged weapon.” Happ expands upon how the combat evolved into a more classic shoot em’ up game like Contra. 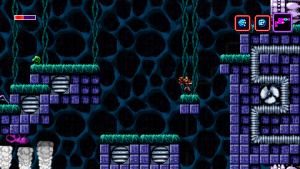 “Sprites [in Axiom Verge] and tiles generally only have 4 colors. I didn’t limit myself to the 256 colors on the SNES. Axiom Verge looks like a NES game, but without those limitations…the hero is still flesh colored and realistic. Particles affects,” especially wouldn’t work on the older hardware, “each enemy explosion has more pieces that could be drawn on a NES. I tried to stay with what would service the enjoyment feedback loop of the gameplay” as opposed to adhering to the strict rules of an NES game. Axiom Verge is available today on the PlayStation 4 and later this year on PlayStation Vita and PC.